I haven’t been cooking new things much at home lately, but last Sunday I decided to grab an issue from the stack of backloggd Food and Wines and pick out a dinner option. 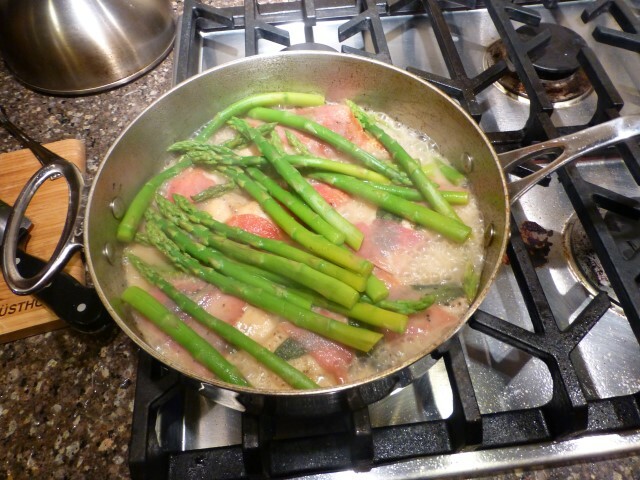 I grabbed the April 2014 issue with Mario Batali’s Chicken Saltimbocca with Asparagus recipe. 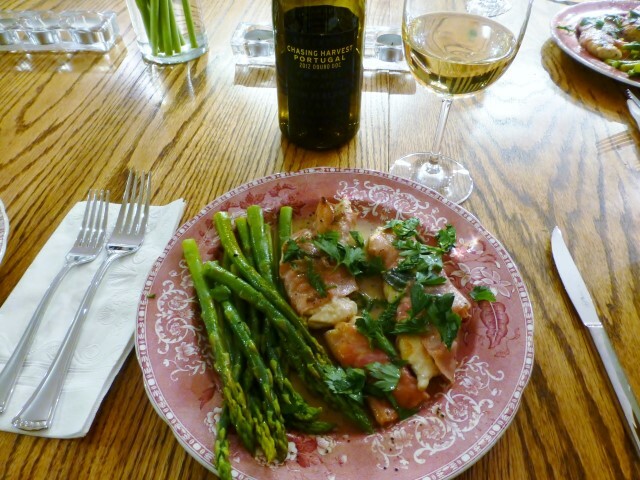 I never made a Saltimbocca before, but I’ve ordered it dozens of times while out and about. How can you not love a nice piece of chicken wrapped in prosciutto? Mario’s recipe adds some sage between the chicken and the prosciutto (which isn’t all that uncommon, but I don’t think I’ve had it in a few years – obviously, I’m going to the wrong restaurants). The sage really made the dish so much better. The prep took the longest part to make this meal as the chicken is pounded thin, so once the meat hits the heat it’s done in just a couple minutes. We were pretty damn happy with this recipe – it was easy, it was tasty and we will make it again — with some changes. Plated and ready to go, paired with a 2012 Douro DOC Vinho Branco from Portugal. Take a look at the original recipe over at Food and Wine first — next time I’ll add more prosciutto (maybe 2-3 slices per piece of chicken) as it was a bit overpowered by the other ingredients. I’d also finish this recipe off with some grated cheese – perhaps some parm or pecorino – I’ve never had a meal where a cheese finish reduced it’s loveliness, have you? January is always a very busy time for me at work – so much so that I have a rule that no one on my team can take any time off from Christmas until mid-February. There is one sweet spot in January where we have 3-4 days where we’ve finished our year end work and can’t start our year-begin work. This sweet spot is when I try to escape for a little bit. Last year I headed off to Shanghai for 4 days. I chose Shanghai because MS was there for work, and I found really cheap airfare. 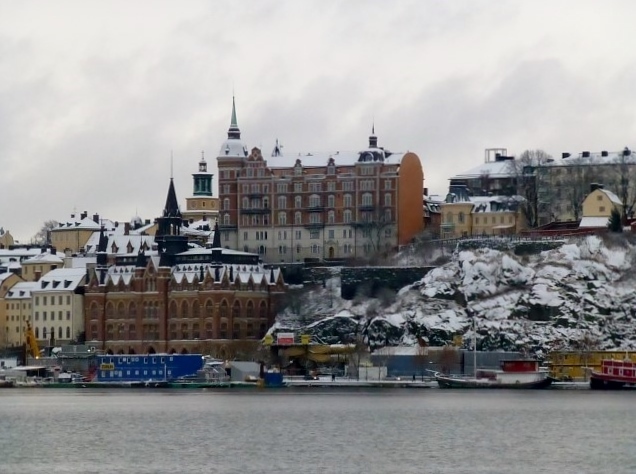 How did I pick Stockholm…in January no less? Well, MS was heading to Brazil for a two week work trip and I initially planned on joining him – until I started checking airfare. For the weekend (a/k/a my work calendar sweet spot) in question, the airfare was nearly $3K for a simple economy plus seat on United. That’s absolutely insane – I have never spent that much on a single ticket in my entire life. I can’t imagine ever doing so. I still wanted to take a trip that weekend so I headed on over to Google to search for destinations with reasonable airfare that fit my very restrictive travel schedule. Not surprisingly, the cheapest destinations were cold weather destinations – Oslo, Copenhagen, Helsinki, Stockholm. These destinations were all about $800 round trip. I found trips to Addis Ababa for $900 and Beijing and Shanghai for about $950. I was really tempted by Addis Ababa, but the timing wasn’t ideal (I’d only have about 30 hours in the City). MS had already been to Stockholm and had a good time, but wasn’t really interested in returning anytime soon. My trip was quick – technically the timing was pretty much like the prior year’s trip to Shanghai. Since I had to connect in Newark, my travel time from ORD to ARN took about 13.5 hours (including the layover). I even had the same amount of time on the ground in Stockholm as in Shanghai. Have you been to Stockholm? Do you think it’s nuts to go to Sweden in January? Do you have a time at work where you really want to get away, but cannot because of sill schedules? Does the idea of a 4 day trip with 26 hours in transit and 52 on the ground seem absolutely stupid to you? I was reading an article in Food and Wine this month (paper version – I can’t find it online right now) about a restaurant in Shanghai called Ultraviolet by chef Paul Pairet (of Shangahi’s Mr. and Mrs. Bund). For those who don’t know Paul Pairet, he’s a French chef who is now based in Shanghai and has won dozens of awards for his restaurants – check him out on his own website. For those of you who read Tim-Foolery regularly, you know that hen we travel dining out is one of our top priorities. We want to try new food and new culinary experiences, but the concept behind Ultraviolet gives me pause. According to Time Out Shanghai you enter the hidden restaurant through large automatic mesh metal doors. You enjoy a cocktail in an anteroom then another set of doors magically open and you are led into an all white dining room. The restaurant is heaven for audio/video geeks – with special music set for each course and the walls of the intimate dining room are ever changing with numerous visuals that are also timed to match up with each course. An award winning chef and truly unique dining space – what would give me pause, you are probably wondering? I noted above that this restaurant is hidden — not like other things in Shanghai where you just can’t find it because of poor street signs or numbering, but because it is intentionally hidden. To visit this restaurant you are picked up by a van and delivered to a former warehouse space. I love trying new things, but the idea of getting into a random van in Shanghai freaks me out. I envision getting into this van then waking up 18 hours later missing a kidney or two. I think my concern is that this happens in Shanghai — I’d probably do the whole van thing in London, New York or Paris, but Mexico City or Shanghai, not so much. I would love to try this restaurant if I ever head back to Shanghai — but I would definitely make sure I checked in with the hotel and snap a photo of the van / license plate and upload so if/when I go missing there would be at least a lead for the authorities. Ultraviolet Shanghai (Extended Version) from Limelight Studio on Vimeo. What do you think about this? Would you visit Ultraviolet? Am I nuts for being concerned about the whole kidnapping possibility? Have you been to Ultraviolet? A friend shared an article with me from The Age entitled “How Dumb Tourists are Ruining Great Places” last week. The author posits that tourists are destroying some of the great tourist destinations around the world by doing things that are synonymous with that location. For example, adding a Love Lock to bridges in Paris (for those who don’t know, a Love Lock is a simple padlock where you carve/write your initials and the initials of your loved one and lock it to the bridge – the key to the lock is then thrown away, symbolizing your undying love). I’ve always thought the love lock idea was just stupid and I’ve never done it – but it has been a tradition in Paris for decades. The article continues to say that not only are the locks destroying the aesthetics of the City, but also negatively impacting the structural integrity of the bridges. I don’t think anyone who buys a love lock in Paris is intending to cause the ultimate collapse of a bridge — “I love you so much I want to cause millions of Euros in damage and kill dozens of people” — isn’t something you’ll hear often. Personally I think this tradition is dumb, but it is a tourist tradition. I say let the tourists put a lock on the bridge – but I also say these locks should be removed on a regular basis so as not to overwhelm the bridge – maybe once a week or once a month (I don’t have enough stats to make a true recommendation). To pay for the labor of removing these locks, I suggest adding an additional tax on padlocks – say 1 Euro per lock – again, I don’t have the underlying data to see if that is enough, but you get the idea. The tourists continue the tradition, a new job is created and we can all move on. A few years ago an artist removed all the locks on one bridge in an evening and used the salvaged items in an art project. Yes, I know my solution is simple and I haven’t vetted the economics or logistics (and I likely won’t). As global tourism increases we’ll see more and more actions / damage like this. While I think one should have the right to participate in these long standing tourist traditions, my question to you is why do you want to? Does leaving this lock really cement your love – or are you just trying to get laid? Our goal for this quick trip was to maximize our Thanksgiving weekend and get out of the cold in Chicago. This trip definitely fit the bill. Was it perfect? No, not at all. We had some pretty good food. We didn’t get sick, robbed (or murdered) – which is definitely a win in my book. I mention getting murdered because I think we all have this perception that Mexico is such a dangerous place to visit and it can be. Interestingly enough, the crime stats for Mexico City are better than Chicago when it comes to violent crime. Chicago’s murder rate is substantially higher than Mexico City’s. We even had a cab driver comment (when he found out we were from Chicago) on the murders: “Ay – Chicago is so dangerous. Murders all the time. How can you live there?” That’s a telling tale, isn’t it? A Mexico City cab driver comments on the rampant crime in Chicago. Would I return to Mexico City? Absolutely. It has much more of a European feel than I was expecting. Next time, I’ll stay in the Polanco neighborhood and try to get a local to take me on a street food tour. So many of the things we saw on the street looked amazing, but also looked like they would ravage our digestive systems. We need local help. Mexico City isn’t high on the revisit list, but it is still there and I will definitely be heading back. What are your thoughts on the City? What did we miss that should make the list for next time?